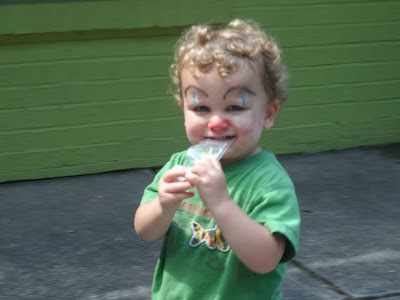 Have you ever googled 'clowns'? Click on the images section - they are super creepy. I assumed that the pictures would be of happy, fun clowns, so I mistakenly googled 'creepy clowns' first. No need to put the adjective in there. Why was I searching for 'creepy clowns'? Because I wanted to compare with my own. It's the eyebrows, right? Sidenote: this was not my doing. It does make me laugh. I hope none of my readers are coulrophobic. Hey-thank you for all of your great comments. I have tried to comment on your blog before, but it would never go through. (and I am hoping this one will!) It is nice to see other mom's that have been through this before!